If you still feel tired after the holidays or have a slight case of the winter blues, mBit Casino and one of our favorite Bitcoin operators Fortune Jack have some great news that might cheer you up. Both BTC casinos are running separate slot and table game tournaments throughout next week, each offering prizes in Bitcoins plus some free spins. Learn about both offers when you check out our full update and get ready for some juicy winter treats! The rules of both tournaments are as simple as they can be. 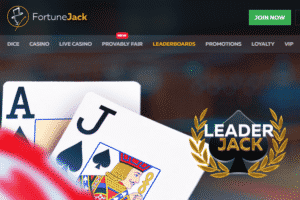 All you need to do to qualify is to make real money bets on Blackjack games or slots, respectively, in order to earn more points for the leaderboards. The more you play, the higher you climb upwards. And the best part of all is that any prizes given in the competitions DO NOT have any wagering requirements attached to them. So, if you feel like winning some free coins on top of what you earn on your favorite games, make sure to go to Fortune Jack Casino and sign up! Another casino that’s running new tournaments throughout next week is mBit Casino, where you’ll have a chance to win additional mBTC prizes and free spins rewards just by playing slots and table games with real cash. However, unlike Fortune Jack Casino, the prize pool for the slot and table tournaments are different here. For slot players, the casino is offering a prize pool of 400 mBTC + 500 free spins which will be dispersed over 45 players who qualify on the leaderboard. The highest prizes are 100 mBTC, 70 mBTC, and 50 mBTC for the first, second, and third players, respectively while the lowest rewards are 10 free spins. As for the table game tournament, it offers a prize pool of 200 mBTC that will be given only to the top 10 players, the first of which will get 60 mBTC while the last a prize of only 4 mBTC. If you’re interested in learning more about either competition, just go to mBit Casino and find the tournaments page.